Bognor Golf Club held their over-50s four-man team event and 172 visitors played, which is a tribute to the popularty of an event which sees numbers increase year by year. Club manager James MacLean and his team of helpers organised the logistical challenge. The competition is played with the morning and afternoon split, with prizes being awarded for the first five teams in both time periods. There is also an overall winners’ prize, which went to Royal Winchester’s team. Results: AM - 1 Royal Winchester (Geoff Winchcombe, Alan Alborough, Max Curtis, Chris Grant) 121; 2 Waterhall (William Evenden, Tony Richardson, Paul Phillips, Lesley Woolgar) 117; 3 Tyrrells Wood (Alan Self, John Luff, Brian Chester, Ian Gale) 115. PM - 1 Ham Manor (Kevin Wilson, Colin Davies, Ivor Mitchell, Dave Rushton) 116; 2 RAC Golf (Ted Taylor, Martin Dennis, John Enston, Mike Corcoran) 115; 3 Lee-On-The-Solent (Dave Purling, Steve Jones, Richard West, Rod Dodman) 115. * Bognor held their annual double competition, the Hardwick Bowl for men with handicaps up to 12, and the Junior Cup for those above 12 handicap. Nearly 100 men turned out in excellent weather and course conditions. Andrew Greig won the Hardwick Bowl with an excellent gross 75, nett 63, ahead of Craig Johnson with 71/64 and James MacLean with 70/66. Chimney sweep Gary Strowbridge brushed aside the opposition to win division two. Christopher Goy won the Junior Challenge Cup with gross 83, nett 67. Second was Andrew Lee on countback with 87/67 and third was Jeff Clark with 84/68. * The Junior Spring Trophy was played at Bognor, sponsored this year by the Field family in memory of Robert Field, who had supported this tournament for several years. Conditions were tricky, with the course difficult because of the rough being so thick after recent rain. Last year’s winner Harry Isham came in 37 points, which proved the winning score by five points from Katie Field. Isham also won the nearest-the-pin contest on the fifth hole. * Bognor juniors hosted the second round of the West Sussex League which sees them compete against Goodwood, Ham Manor, the West Sussex club and Worthing. The team were led from the front by captain Katie Field, who scored a tremendous gross 68, a new ladies’ course record. Harry Isham (32pts), Harry Malin (36) and Charlie Maginess (30) helped account for a 19-point win, taking Bognor to joint top of the league with Goodwood. Cowdray’s men’s section held their captain’s day. Nick Beaumont won with 42 points, second was Todd White, shooting level par with 40 points, and third was Nick Caws with 40. The ladies’ section played for the Syrett Cup. Anne Chuter won with 39 points, ahead of Amanda Paddle (36) with 35 and Chris Sommerville with 34. The ladies also played the Bannister Cup. Excellent scoring from Sonia Burden (26) with a nett score of 70 saw her win the cup ahead of Chris Sommerville, nett 73, and third-placed Amanda Lucking, also with 73. The seniors’ June Stableford had a strong entry with 85 players competing. While the course was in magnificent condition, the weather made scoring difficult due to light rain and strong winds. The drizzle finally cleared and was replaced by sunshine although the wind continued to prove a challenge. Overall the scoring was relatively low, reflecting the blustery conditions, and not a single player scored better than handicap. At the top of the leaderboard the scores were tightly bunched with four players on 35 points and another five on 34 points. Congratulations to the overall winner Stephen Henley, who topped division one with Paul Owen (7) second. Chimney sweep Gary Strowbridge brushed aside the opposition to win division two with Tony Sapsworth (19) runner-up. The Chichester vets’ championship is decided over two rounds. The first round is on the Tower course and the second, a day later, on the Cathedral course. Robert Bridges led the first round on the gross scores, coming in with 78. Mike Snuggs was second on 80 and John Styles, winner in each of the past four years, five shots behind with 83. Dieter Matthey had a great round to lead the nett scoring with 65. However, the second round saw a great comeback from Styles, winning the championship for the fifth year running with a score of 86, giving him an overall total of 169. Anthony Denton produced a terrific score of 83 and was a close second with 170. Bridges, who had led at halfway, was third with 173. In the nett championship, Matthey was overtaken by Bob Gale, who had a cracking round, scoring nett 65 and taking the title with a total of 135. Matthey came second with 140 and Martin Powell-Jones was third on 141. Robert Stainsby won the seniors’ cup with a nett score of 145. Pictued, from left, are Robert Stainsby, John Styles and Bob Gale with their trophies. * The Chichester ladies’ senior club championships were played over two days in great conditions. Winner of the scratch prize was Elaine Fell 175 on countback from Caroline Hawkes. The handicap prize was won by Fiona Walsh with 145 with runner -up Val Swain on 150. Thirty-four ladies entered the Joan Davis Rose Bowl and there were some excellent scores recorded resulting in several reduced handicaps. The winner was Angela Perkins with 46 with the runner-up Jane Buckley on 42. Third was Dot Collyer with 41. Other results: Qualifying Stableford - 1 Maria Conner 41; 2 Yvonne Dunckley 32; 3 Lisa Jackson 30. The Chi ladies’ divisional teams are nearing the end of the qualifying rounds. The div-one team lost 4-3 at Cottesmore. The div-two side (Yvonne Dunckley, Fiona Walsh, Lisa Jackson, Heddie Straw, Val Edwards and Sue Ward) lost 6.5-0.5 at West Sussex and at 4-3 at home. Chi’s div-three team lost 4-3 at Haywards Heath and won 4-3 at Worthing. 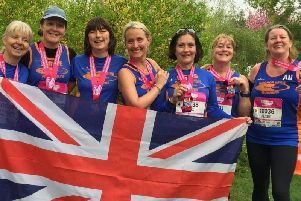 That team comprised Lynn Plowman, Rachael Hutchinson, Nicky Eastland, Pauline Beale, Terry Payne, Carol Stride and Wendy Jeffery. In the latest friendly Chichester won 3-1 at Furzley. Well done to Jan Barnes and Brenda Butler on their debuts in the team. Also in the team were Sue Bond, Lesly Hance, Val Swain, Linda Wood, Tricia Robertson and Fran Syson.